Read on, intrepid capitalists, to discover more about the gap-filling game Masters of Commerce! Masters of Commerce is a fast-paced party negotiation game for three to eleven players (three- and four-player modes are variants) in which players are divided into landlords and merchants. Landlords rent properties to merchants, who use the landlords’ properties to turn a profit on the market. The central board and landlord property samples. All are dry erase boards (for use with included markers). At the start of the game landlord players receive three random properties each, and each merchant receives a small stock of unique player tokens. Properties are small dry erase boards divided into four colors. 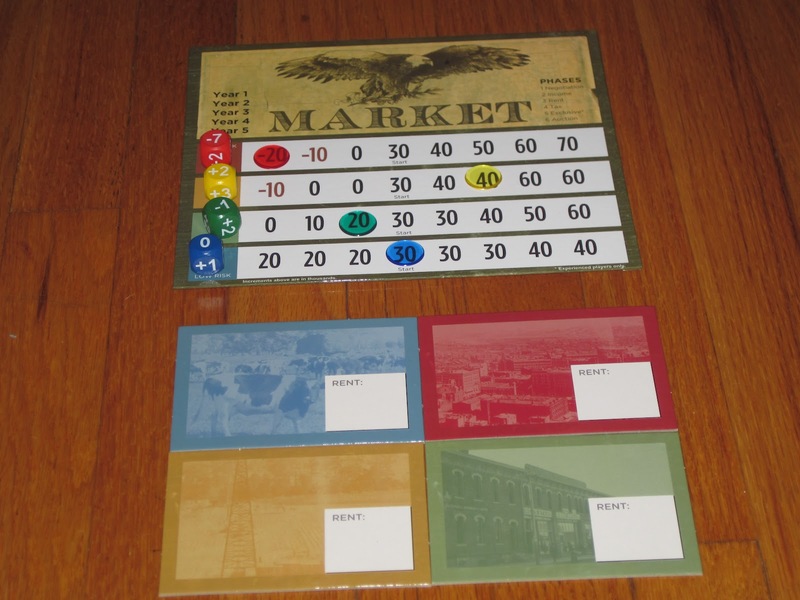 A central market board, which marks the starting prices for goods sold from the four property types, is placed in the center of the table. Each player also receives $120,000. The game is played over five rounds, representing years. In the first phase of a round, players have two minutes to negotiate with one another. Merchant players are trying to negotiate low rent; landlords are trying to get higher compensation. The trick is this: the only way for merchants to make money is to rent properties from landlords. The only way for landlords to turn a profit is to rent their properties (preferably for more than their taxes). 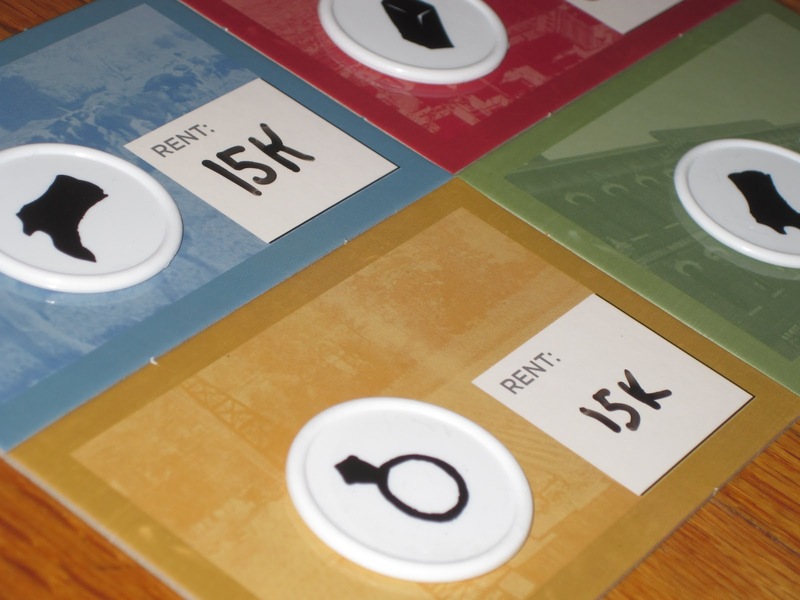 Landlords must pay taxes regardless of whether their are rented, so the game strongly encourages players to work together. Over the course of the two minutes, anything can be promised, negotiated, or renegotiated. However, a deal is only binding if a rent value is recorded on the property and a merchant’s token is placed on that property before the timer runs out. Players can promise anything (in or out of the game), but only the value written on the landlord’s property is binding. At the end of two minutes, the next phase–income–begins. At the start of the income phase the dice are rolled. The dice each have different sway over their markets, representing the volatility of each market. The blue properties provide the safest investment, but they also provide the smallest chance for a good return. Red properties, by contrast, can shift from one end of the spectrum to the other in one year, but they also give the chance of the largest payout. After the dice are rolled and the prices adjusted to reflect the current state of the market, merchants receive cash for each property they rented. The next phase is rent, wherein merchants must pay their landlords the prices agreed upon. They may choose to reneg on the other amenities offered, but they must pay the value written in the rent space on the landlord’s board. Landlords must then pay taxes, $10,000 to the bank for each property they own. Finally, new properties are auctioned for the landlords to add to their holdings, and after the auction, the next year begins. Masters of Commerce is a blast. Simply a blast. It combines the unbridled raucousness of Pit, the Euroy market of Power Grid, the haggling of Bohnanza, and the thrill of high-stakes gambling into a sleek package that’s easy to learn and fun to play. This is what sealed the deal for me. 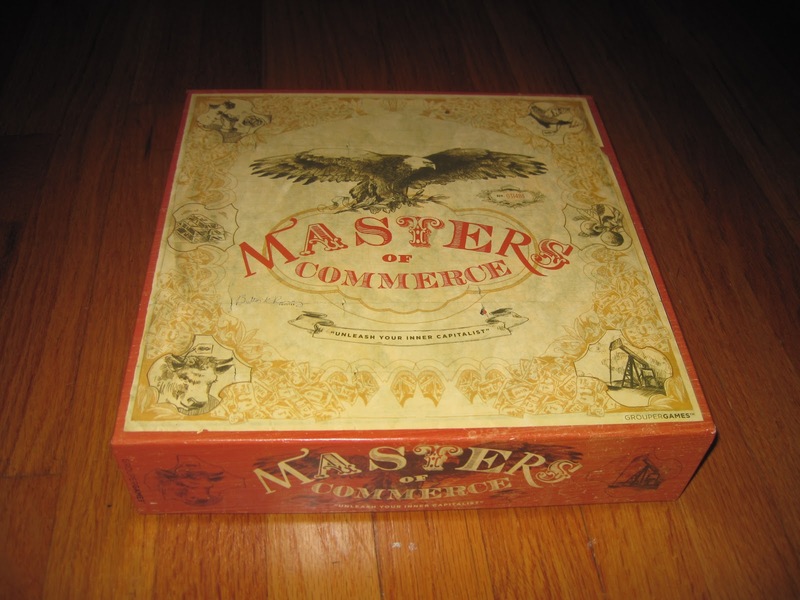 The first thing you’ll notice in opening Masters of Commerce is the bits. Grouper Games is an indie publisher (the only game listed on their website is Masters of Commerce), but they landed some fantastic components. All of the properties are dry-erase boards (as is the central board), which is a fun (and practical) novelty. The game comes with custom engraved wooden dice. Each merchant’s tokens come with a superfluous drawstring bag–unnecessary, but a nice touch. 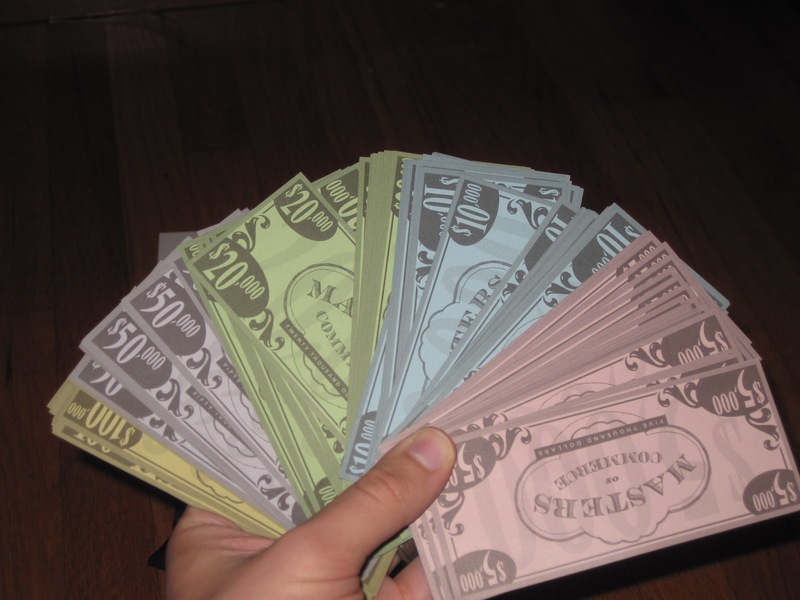 The paper money has good color and, insofar as paper money can have a nice feel, a nice feel. The only negative in the components is the lien and exclusive tokens, which are printed on generic cardboard. These aren’t used much in the game, so it’s not a huge deal, and the rest of the package is nice. Some may find the rulebook a challenge. What rules are there are straightforward and well-written, but the game is fairly open-ended, which will bother some players. Personally, for the kind of game this is, I appreciate the places where the detail is a little lax. (For example, the rules do not specify how properties should be auctioned, so we used some of Knizia’s methods present in Modern Art.) The rulebook specifies where it needs to but leaves a lot up to the players themselves to determine. For gamers, this shouldn’t be an issue, but it might be intimidating to others. In fact, the open-ended nature of the game is one of the few things about it that gives me pause before recommending it to every person I know. The game is similar to social experience games like The Resistance, Werewolf, or Silent Football in that it helps to have someone “on the inside” to get the game going. (When I play The Resistance with new players, for example, in the first game I make sure to accuse each person of being a spy. Good strategy? Not really, but it helps them understand right away what’s going on.) 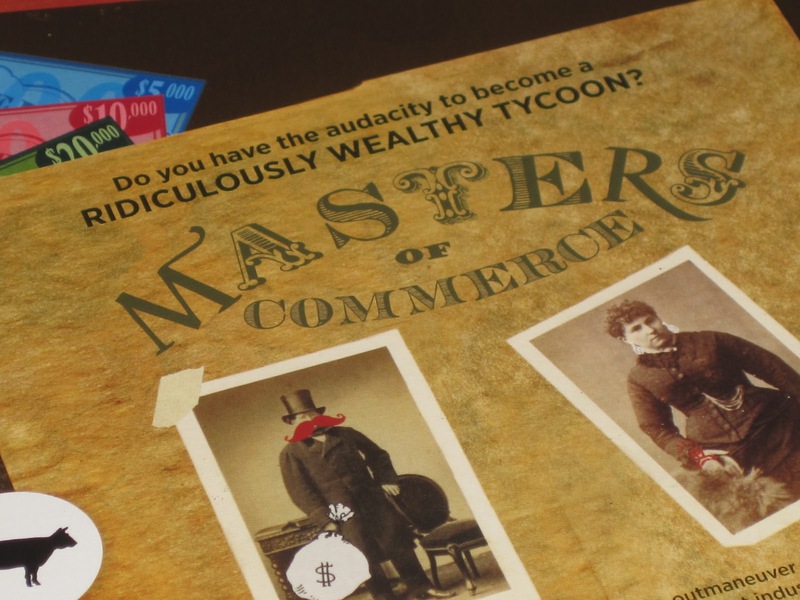 In our first game of Masters of Commerce, none of us really knew what we were doing. I had some idea of what we were supposed to do, but we were a little timid at the start of negotiations. It was more of a gentlemen’s game of manners, with no one interrupting anyone else, than the raucous game it is designed to be. But after the first year–when the merchants saw the potential for heaps of filthy lucre–the negotiations became more lively and cutthroat. The game plays quickly–the 45 minutes specified on the box should be easy to hit, even with a rules explanation–but you’ll want to make sure you have an open area where you can play the game as it can get pretty rowdy. In other words, while this game will fit over a lunch period, it may not be appropriate for cafeteria play. You will also want to be sure to round up a good number of players. While the game can be played with as few as three or four, it seems designed with the “more is better” mentality in mind. And since lots of players can participate, it helps that there are two winners in order to spread the joy of victory around. This is what being fabulously well-to-do looks like, ladies and gents. I’ve greatly enjoyed my time spent with Masters of Commerce, which isn’t a surprise. (Seriously: I saw the “Do you have the audacity…?” banner and knew this game was for me.) What was a surprise was @Futurewolfie’s reaction to it. When he saw the box, I noticed his eyes glazing over. He was entering shutdown mode. Generic theme, drab colors. Where are the lasers? But when we actually began playing, he recognized several mechanics reminiscent of his most beloved games: negotiation, treachery, dice. Our game together was not only a highlight for me, it was a highlight for him as well. That being said, Masters of Commerce will not be for everyone. First of all, you have to have access to a large group (at least six, probably closer to eight) to really enjoy this game. Second, this game is very open-ended, even beyond the rules. 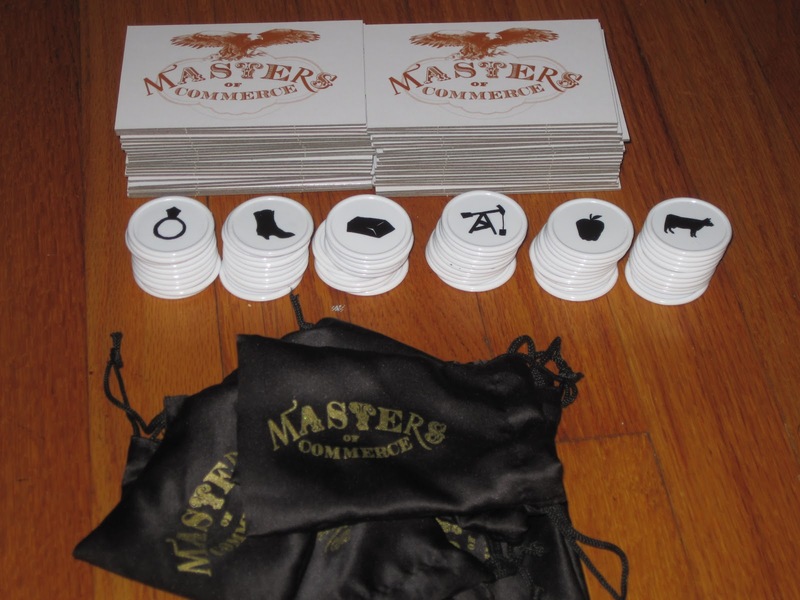 Masters of Commerce is a negotiation game, which involves reading other players and working outside of a smooth system (which may involve greasing palms). The dice can bring huge swings of luck. Even though this is a game with lots of paper money, it is not an exercise in calculation. It is primarily a social experience game–and I think it’s better for that. There is also a very small possibility for player elimination, but it’s such a long shot that I wouldn’t worry too much about it. I’m surprised I haven’t heard more buzz about Masters of Commerce, as this game seems perfect for large groups, gamers or non. At any rate, I’ve had tons of fun with it. I can’t wait to take this game to my next family gathering. And I’m pretty sure you’ll want a copy at yours, too. 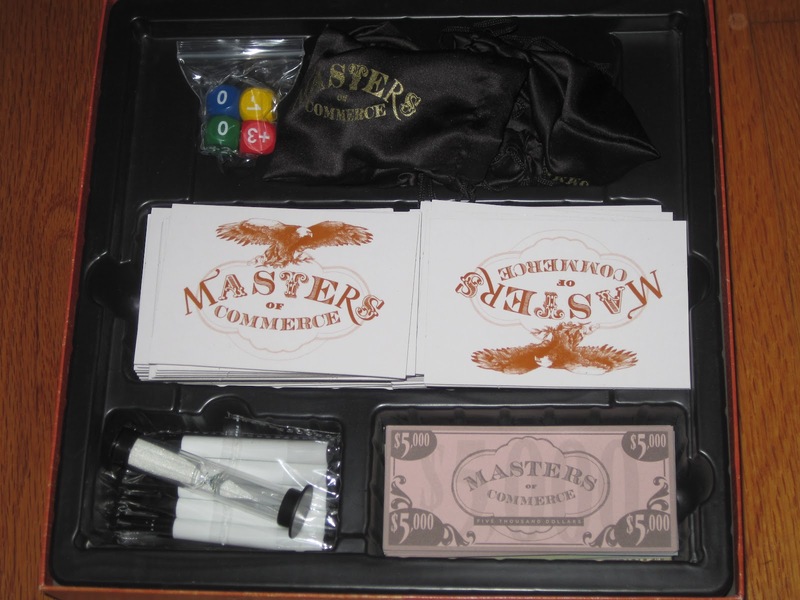 iSlaytheDragon would like to thank Grouper Games for providing a review copy of Masters of Commerce.